Upper Clapton is part of Clapton in East London, located in the London Borough of Hackney. Upper Clapton approximates to the northern part of the E5 (Clapton) postal district. The district borders the River Lea (spelled Lea or Lee) to the east and the border with Lower Clapton to the south is marked by the Lea Bridge and Kenninghall Roads. Neither Upper Clapton nor the wider Clapton area have ever been an administrative unit and consequently their extent has never been formally determined. Describing Upper Clapton as northern E5 is useful but also informal and imperfect, for instance a small area of Clapton Common and the immediately adjacent community is excluded from the postal district despite almost always being publicly viewed as being part of Upper Clapton. As is frequently the case with London districts, these boundaries are often uncertain and overlapping because of the meeting of the developing expansion of the original settlements. Western parts of the area are often considered part of a wider Stamford Hill, understandable perhaps because of the public transport junction and shopping area at Stamford Broadway, and that the Hasidic Jewish community identified as being located in Stamford Hill extends into Upper Clapton. Clapton was from 1339 until the 18th century normally rendered as Clopton, meaning the "farm on the hill". The Old English clop — "lump" or "hill" — presumably denoted the high ground which rises from the River Lea. Clapton grew up as a straggling hamlet along the road subsequently known as Lower and Upper Clapton Road, and as the area became urbanised, the extent of the area called Clapton eventually increased to encompass most of the north-eastern quarter of the Ancient Parish and subsequent Metropolitan Borough of Hackney. The area, along with Lower Clapton, was known in the 1990s and early 2000s for drug and gun related crimes, gaining it the nickname "Murder Mile". As well as being featured in the film Bullet Boy, Clapton's reputation was highlighted in an episode of Channel 4's satirical TV show Brass Eye in 1997, which claimed that the petrol station was shoplifted every 30 minutes. One of the most pleasant amenities in Upper Clapton is Springfield Park, which extends down the hill eastwards to the Lea. This park was created in 1905 from the extensive grounds of three mansions, of which only one survives: Springfield House, now known as the White House (a Grade II listed house ), houses a café and the municipal rangers' station. The park's sports facilities include five tennis courts and a cricket pitch, while to the north, just across Spring Hill in the recreation ground, there are rugby fields (home of the Hackney RUFC), more tennis courts, and football pitches. Across the Lea, on the ancient Essex and modern London Borough of Waltham Forest border, is Springfield Marina, a packed mooring for narrowboats and other waterway craft, while on the other bank of the river is the Lea Rowing Club. The park received a Green Flag award in July 2008. Aside from the mansion, another survivor is the Anchor and Hope pub, which is not far from the south-east corner of the park. The area along the Lea was heavily bombed in the Second World War, and the pub is one of the few survivors of the terraced housing that once dominated the area. It is now quite overshadowed by pre- and post-war blocks of flats. Besides Springfield Park, Upper Clapton is delineated to the west by the long leafy strip of Clapton Common, distinguished by its recently regenerated pond. The name Clapton Pond, however, refers to a set of two much smaller ex-reservoirs in Lower Clapton, and bus routes that use Clapton Pond as a terminus point are referring to Lower Clapton. The pond is a favourite with bird watchers — besides the usual variety of ducks, geese and swans, such shy birds as grebes and other waders may often be seen feeding in the reed beds. Upper Clapton is home to one of London's more unusual churches, the Church of the Good Shepherd, which was used as a place of worship by a splinter group of the Catholic Apostolic Church and now is used by the Georgian Orthodox Church. However, the church was originally built by the Agapemonite cult in 1892 as the Church of the Ark of the Covenant. The Agapemonites, who held decidedly unconventional views on marriage and the role of women, relocated to Upper Clapton from their spiritual community in Spaxton, Somerset, and had clearly prospered by this time. Although it is fairly conventional in floor plan, the outside of the church is a riot of statuary and symbolism. The main doorways sport large carvings of angels and the four evangelists symbolised by a man, an eagle, a bull and a lion. The same four figures, cast in bronze, look out over the four quarters of the Earth from the base of the steeple. The two flanking weather vanes show a certain symbolic debt to William Blake's Jerusalem depicting, as they do, a fiery chariot and a sheaf of arrows (presumably of desire), while the main steeple is clearly surmounted by a spear. The stained glass windows, designed by noted children's book illustrator Walter Crane, and made by J S Sparrow, betray the unconventional nature of the sect as they illustrate the 'true station of womankind'. The church, which was completed in 1895, was designed by Joseph Morris and his family, some of whom wre member of the sect. The style is Gothic Revival; for its "curiosity value" it was designated a Grade II-listed building on 12 September 1969. The cult had always been surrounded by scandal during its sojourn in Somerset and, after the move to Clapton, this degenerated into sheer farce. The original leader, Henry James Prince, who claimed to be immortal, died in 1899 and was succeeded by the charming but philandering John Hugh Smyth-Pigott, who wasted no time before declaring himself as the Messiah. Challenged by a jeering mob to prove his godhood by walking across Clapton Pond, Smyth-Pigott declined and retired to Somerset, where he was said to enjoy the favours of as many as seven "spiritual brides" a week. Smyth-Pigott, who also claimed immortality, died in 1927, after which the cult went into decline. The Clapton church had already been abandoned by the cult and was acquired first by the Ancient Catholic Church in 1956, and then by the Georgian Orthodox Church in 2005. Close by the Good Shepherd is the stately New Synagogue, on the eastern side of Clapton Common. This Grade II listed building is a little deceptive, appearing much older than it actually is. In spite of its handsome Georgian-style exterior, this is actually post-Edwardian, built in 1915. It is, however, a faithful replica of an earlier building, the Great St Helen's Synagogue in the City of London, which was designed by John Davies in 1838. The current building contains a number of original fixtures from its predecessor. Endangered for a while, the synagogue was restored in 2005. A large house known as the King's House stood on the site now occupied by BSix Sixth Form College, as early 1476. The house was within a 200-acre (0.81 km2) estate, which was described as the Manor of Hackney from about 1532 to the early 17th century — although there were two other manors in the south of the Parish. In 1532, Henry Algernon Percy, Earl of Northumberland, acquired the estate from Sir Richard Neville. However, in January 1535 the land was taken by Henry VIII; in settlement of a debt. The King visited the house in April 1535 and on 24 September 1535 he granted his "manor or principal messuage of Hackney" to Thomas Cromwell, his chief minister. Cromwell refurbished the house, and on 1 May 1536, returned the house to the King. In July 1536, Ralph Sadleir brought Mary I of England to the house to swear the Oath of Supremacy before her father, and Jane Seymour, the Queen. Henry continued to own the house until his death in January 1547. Edward de Vere, 17th Earl of Oxford, died in the house in Hackney known as the "King's House" on 24 June 1604. The remains of the house were destroyed by enemy action in October 1940. 5.5 acres (0.02 km2) of Brooke House were purchased by the London County Council in 1944, and further bomb damage occurred that year. The house was finally demolished in 1954, and archaeological investigations of the Tudor palace took place in 1955–6. New school buildings were erected in 1960, designed by Armstrong and MacManus. BSix Sixth Form College is a sixth form college on a site near the Lea Bridge roundabout in Clapton. About 2 miles by bus, the nearest London Underground stations are Tottenham Hale, Manor House and Seven Sisters. ^ Mendick, Robert; Johnson, Andrew (6 January 2002). "Eight men shot dead in two years. Welcome to Britain's Murder Mile". The Independent. Retrieved 17 May 2011. ^ "White Lodge, Hackney". www.britishlistedbuildings.co.uk. Retrieved 31 January 2013. ^ Herbert, Shiranikha (9 September 2010). "Court rules 'Ancient Church' is defunct". www.churchtimes.co.uk. Retrieved 16 January 2019. ^ Historic England. "Details from listed building database (1235310)". National Heritage List for England. Retrieved 16 January 2012. ^ "(Former) Agapemonite Church of the Ark of the Covenant, Upper Clapton, London (Exterior)". www.victorianweb.org. Retrieved 16 January 2019. ^ Historic England. "Details from image database (425966)". Images of England. Retrieved 22 January 2009. ^ Historic England. "Details from image database (426739)". Images of England. Retrieved 22 January 2009. History of Clapton. British History Online. Retrieved 30 October 2016. "Upper Clapton" at freeservers.com. Retrieved 30 October 2016. 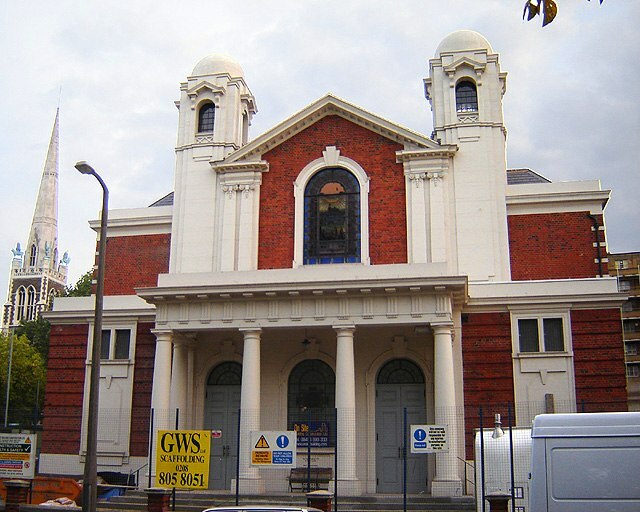 "New Synagogue, Egerton Road" from www.oldsynagogues.org. Retrieved 30 October 2016. The Agapemonites or Community of The Son of Man was a Christian religious group or sect that existed in England from 1846 to 1956. It was named from the Greek: agapemone meaning "abode of love". The Agapemone community was founded by the Reverend Henry Prince in Spaxton, Somerset. The sect also built a church in Upper Clapton, London, and briefly had bases in Stoke-by-Clare in Suffolk, Brighton and Weymouth. The ideas of the community were based on the theories of various German religious mystics and its primary object was the spiritualisation of the matrimonial state. The Church of England had dismissed Prince earlier in his career for his radical teachings. The Agapemonites predicted the imminent return of Jesus Christ. According to newspaper accounts, Prince's successor, John Hugh Smyth-Pigott, declared himself Jesus Christ reincarnate. The Agapemone community consisted mostly of wealthy unmarried women. Both Prince and Smyth-Pigott took many spiritual brides. Later investigations have shown that these "brides" were not solely spiritual and that some produced illegitimate children. In 1860, Prince lost a lawsuit brought on behalf of Louisa Nottidge by the Nottidge family and the group vanished from the public eye. It finally closed in 1956 when the last member died. Charles John Melville Godfrey (24 November 1862 — 28 September 1941) was an English cricketer. He was a right-handed batsman and a right-arm fast bowler. He was born in Upper Clapton and died in Great Chesterford. Having represented Oxford University between 1882 and 1885, Godfrey played for Sussex in 1885, 1889, 1890 and 1892. Godfrey played in four matches in 1889. The following season saw the inaugural County Championship campaign, in which Godfrey played four games, and achieved his best bowling, a return of five wickets for 22 runs in the match against Yorkshire. Having sat out of the 1891 season, he made a single, final first-class appearance in 1892, also against Yorkshire. Godfrey was educated at Magdalen College School, Oxford, and Hertford College, Oxford. Outside cricket, he became a clergyman, and the notice of his death in The Times in 1941 states that he was lately the vicar of St Michael and All Angels' Church, South Beddington, Surrey. Clapton is a district in the London Borough of Hackney, in North East London. It is separated into Lower and Upper Clapton. It was a suburb of the metropolitan area of London until 1965 when it was reformed and expanded. Clapton is a London Overground station on the Chingford branch of the Lea Valley lines, located in Upper Clapton in the London Borough of Hackney, north London. It is 3 miles 78 chains (6.4 km) down the line from London Liverpool Street and is situated between Hackney Downs and St. James Street. The station is in Travelcard Zone 2 and Zone 3. Colin Andrew Ignatius Peter McFarlane (born 15 September 1961) is a British actor and voice actor. Dalton Grant (born 8 April 1966) is a British high jumper, who has won a total number of four national titles for Great Britain (AAA Championships) in the men's high jump event. His personal best jump is 2.36 metres, achieved at the 1991 World Championships in Tokyo. He has a personal indoor best of 2.37 metres.Grant was born in Hackney to parents from Jamaica and lived in Brooke Road, Upper Clapton. He went to Hackney Downs School where he started to high jump. He also represented Hackney in the London Youth Games in athletics.He was later inducted into the London Youth Games Hall of Fame in 2011. Essex/Canterbury Jack 1 is an English Rugby Union league at the ninth tier of the domestic competition and features teams from Essex and parts of north-east London. Promoted clubs tend to move up to London 3 Essex. Relegated clubs used to drop into Essex Spitfire 2 but as that division has been abolished there is currently no relegation. The division was created in 2003 by Essex-based teams who left Eastern Counties 1 and Eastern Counties 2. Each year some of the clubs in this division also take part in the RFU Junior Vase - a level 9-12 national competition. For the 2016-17 season the league was divided into two parallel divisions - Essex 1A and Essex 1B - divided on geographical lines with teams in Essex 1A typically based in the north and east of the county, while teams in Essex 1B are predominately London based. Each division plays 14 home and away games from September until February. From February the top 4 teams from each division go into the Essex Canterbury Jack 1 Premiership and play for the title and promotion, while the bottom 4 sides from each group would play for the Essex Canterbury Jack 1 Shied. For the 2018-19 season Essex Canterbury Jack 1 would revert to being a single division of 11 teams. Henry William Allingham (6 June 1896 – 18 July 2009) was an English supercentenarian. He was the longest-lived man ever from the United Kingdom, a First World War veteran, and, for one month, the verified oldest living man in the world. He is also the second-oldest military veteran ever, and, at the time of his death, he was the 12th-verified oldest man of all time. Allingham was the oldest-ever surviving member of any of the British Armed Forces, and one of the oldest surviving veterans of the First World War. He was the last survivor of the Battle of Jutland, the last-surviving member of the Royal Naval Air Service (RNAS), and the last-surviving founding member of the Royal Air Force (RAF). In 2001, he became the face of the First World War veterans' association, and made frequent public appearances to ensure that awareness of the sacrifices of the First World War was not lost to modern generations. He received many honours and awards for his First World War service and his longevity. Sir Hugh Low, (10 May 1824 – 18 April 1905) was a British colonial administrator and naturalist. After a long residence in various colonial roles in Labuan, he became the first successful British administrator in the Malay Peninsula where he made the first trials of Hevea rubber in the region. His methods became models for future administrators. He made the first documented ascent of Mount Kinabalu in 1851. Both Kinabalu's highest peak as well as the deep gully on the northern side of the mountain are named after him. John Bain Mackay (5 February 1795 – 9 August 1888) was a nurseryman based in Clapton, London noted for his introductions of Australian and South American plants into cultivation.He was born in Echt in Aberdeenshire in Scotland. At his Clapton Nursery, he propagated plant material sent to him by William Baxter from Australia and James Anderson from South America. In addition to his nursery, he had a showroom in King's Road, Chelsea. His foreman, Hugh Low, took over the nursery in 1831.Mackay became a Fellow of the Linnaean Society. He died in Totteridge, Hertfordshire on 9 August 1888 at the age of 93. John Byass (8 May 1854 – 6 June 1936) was an English cricketer. He played four first-class matches for Kent between 1874 and 1876. London 3 Essex is an English rugby union league that is at the eighth level of the English rugby union system and is available to club sides based in Essex and north-east London. Promoted teams move up to London 2 North East with league champions going up automatically and the runners up playing a playoff against the runners up from London 3 Eastern Counties, while demoted teams usually drop down to Essex Canterbury Jack 1, with new teams also coming up from this league. Each year all clubs in the division also take part in the RFU Senior Vase - a level 8 national competition. The division was created for the 2017-18 as part of an RFU reorganization of the London & South East regional league. Originally there had been a London 3 North East league which had involved teams from Essex and north-east London along with teams from the Eastern Counties (Cambridgeshire, Norfolk and Suffolk). Due to the distances involved for teams travelling potentially from London to Norfolk and vice versa, at the end of the 2016-17 season this league was discontinued. Teams in Essex and north-east London who had played in London 3 North East were transferred into the new look London 3 Essex along with additional promoted teams from the Essex regional leagues, while the Eastern Counties sides went into another new division called London 3 Eastern Counties. Little Pixie Geldof (born 17 September 1990) is an English model and singer. She is the third daughter of Bob Geldof and Paula Yates. Springfield is a ward in the London Borough of Hackney occupying much of Upper Clapton and some of Stamford Hill; the ward is part of the Hackney North and Stoke Newington constituency. The name is derived from Springfield Park. The ward returns three councillors to the Borough Council, with elections every four years. At the last election on 6 May 2010, Michael Levy and Simche Steinberger (both Conservative Party candidates); and Margaret Gordon (Labour Party) were returned. Turnout was 57%; with 3,993 votes cast.In 2001, Springfield ward had a total population of 10,854. This compares with the average ward population within the borough of 10,674. The population at the 2011 Census was 12,371. Springfield Park is a park in Upper Clapton in the London Borough of Hackney. Spring Hill Recreation Ground, immediately to the north of the park, is an additional amenity. The Recreation Ground is also managed by the local authority and together they comprise a continuous public open space. Springfield Park was formed in 1905 from the grounds of three private houses, one of which still survives as a cafe. It is a local nature reserve. William Armstrong, Baron Armstrong of Sanderstead (3 March 1915 – 12 July 1980) was a British civil servant and banker.